Ralph Lauren with its enduring classics from the ever versatile polo shirt with the galloping polo pony to Ralphs blazer, but Ralph adds a huge touch of glamour to any wardrobe alongside his classics with fabulous fabrics, sequins and of course his impeccable tailoring for that exquisite fit. 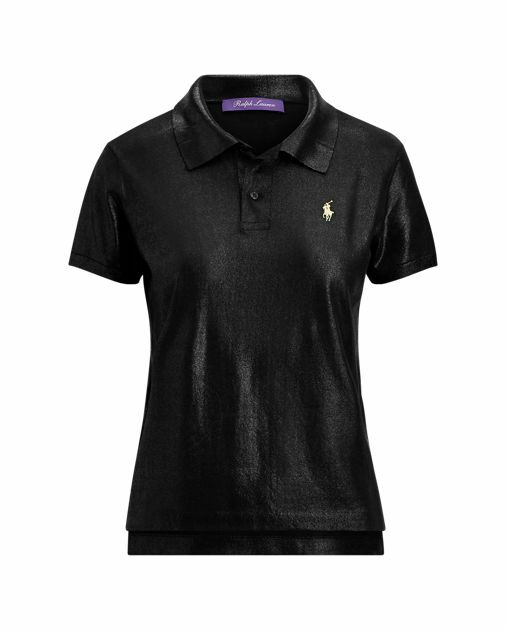 An enduring hallmark of Ralph Lauren style since 1972, our iconic mesh Polo shirt is luxuriously re-imagined in silk jersey plated with an allover foil print that casts a metallic, lacquered sheen. Genuine mother-of-pearl buttons, a vented hem, and our signature Polo logo define its heritage appeal. Continuing the season's theme of pairing sheer and opaque fabrics, this fine rib-knit stretch-infused silk jumper transforms into an elegant, dramatic blouse with a silk chiffon cape and exaggerated raglan sleeves. Specially developed for Ralph Lauren, the laminated poplin in our Anders trousers starts with a plain-weave cotton that's coated with a very fine metallic gold film to create a mirrored lustre while maintaining a light, crisp hand. Evocative of traditional cargo trousers, this Italian-made pair is thoughtfully updated with an exposed zip at the back of each leg. Military style has long inspired Mr. Lauren's designs, and this season he builds on that pillar with this Italian-made dress constructed using an innovative rib-knit technique that emulates sunburst pleating, creating both texture and movement at the skirt. Highlighting the season's focus of re-imagining iconic archival pieces, the Charley draws influence from the first trench coat–inspired shirt that Ralph Lauren released in the '90s. 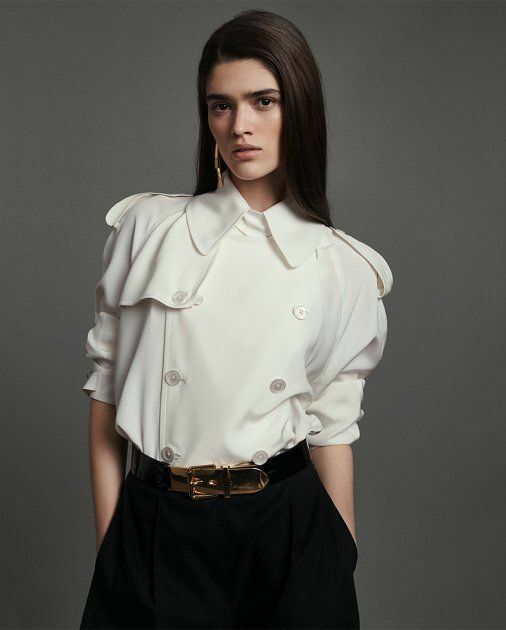 Cut from mulberry silk crepe, this Italian-made piece features authentic trench coat details, including a double-breasted silhouette, shoulder epaulettes, and storm flaps. One of Mr. Lauren's favourite feminine silhouettes, our iconic Hamlin gown is reimagined this season with metallic micro-sequins embroidered onto jersey using a unique technique that creates a crochet-like design on top of each sequin. Next, this Italian-made style is layered with a tulle overlay that's intricately embellished with an array of shimmering beads, revealing an ornate floral motif. Inspired by an '80s archival design, the Helaine unites a traditional menswear silhouette with a wide-leg trouser for an updated take on a feminine jumpsuit. Created in a century-old Italian mill, this American-made style's plain-weave cady is woven with very fine, highly twisted crepe yarn to create a remarkable drape and a smooth hand, while deep front pleats, peak lapels, and an exaggerated leg magnify its timeless-meets-modern sensibility. Modelled after a heritage Ralph Lauren shirt and updated with the season's naval-inspired aesthetic, the Adora features a bevy of authentic military details, including polished gold-tone anchor-embossed buttons and removable shoulder epaulettes. Crafted in Italy, this style undergoes a unique fabric-treatment process that gives it a smooth, lustrous finish. The Norwood design combines the look of a quintessential naval-inspired blazer with an elongated silhouette that forms a column dress. This eye-catching Italian-made gown is intricately adorned with metallic micro-sequins to achieve the season's high-shine effect. Utilising an innovative embroidery technique, each sequin is reinforced with four crisscrossing stitches that form a crochet-like design, highlighting Mr. Lauren's dedication to attention to detail. The Bennett transforms a timeless Ralph Lauren silhouette into an exquisite evening coat. Designed with authentic trench coat details, this Italian-made style is crafted from translucent satin-faced silk organza and intricately embellished with an array of tonal beads, revealing a repeating vintage- and Art Deco–inspired floral motif that was custom-created by Ralph Lauren's in-house artists. Long informed by collegiate style, Mr. Lauren elevates the iconic cricket jumper with a dose of modern glamour and shine. Slightly cropped with a body-contouring fit, this silk jumper is embellished with micro-sequins that are meticulously layered over the rib knit and striped trim, creating an intricate 3D effect. This Italian-made version of our Anders trousers combines the softness and lightness of suede with the look of shimmering sequins. It's constructed by applying an innovative micro-paillette design on top of lamb suede that's sourced from an Italian tannery. 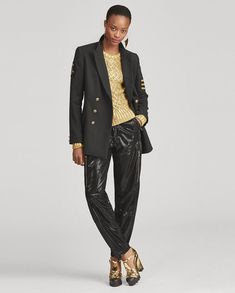 Finished with the season's gilded touches, like exposed gold-tone zippers and gold-tone drawcord tips, the Anders trousers are the ultimate in luxury.